Hubble Space Telescope image of NGC 6052, a pair of colliding galaxies that lies in the constellation of Hercules, about 230 million light-years away from Earth. 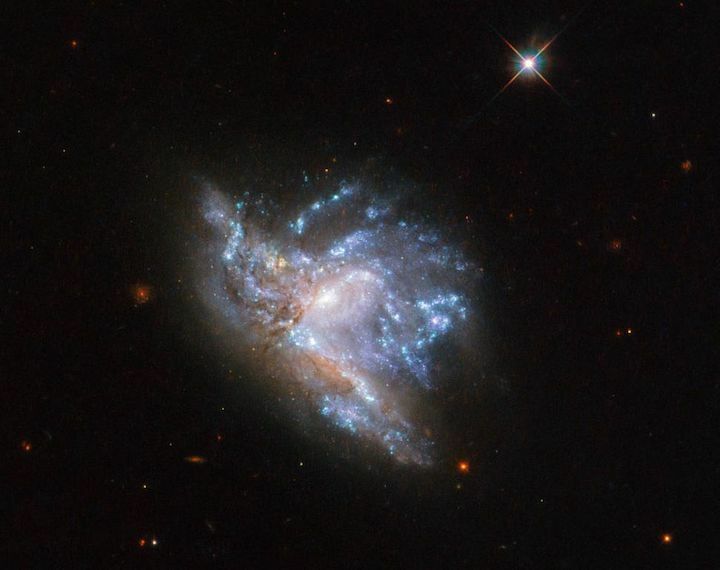 A new image from the venerable Hubble Space Telescope shows what happens when two galaxies collide. That's relevant for us residents of the Milky Way, because our own galaxy is expected to collide with the nearby Andromeda galaxy in about four billion years. The image captures a scene some 230 million light-years away from Earth, in the constellation Hercules. (One light-year is the distance that light travels in a year — about 6 trillion miles, or 10 trillion kilometers.) Here, Hubble zooms in on the merging galaxies, a double object known as NGC 6052. When NGC 6052 was first cataloged in 1784 by William Herschel, it was classified as a single, irregular galaxy with an odd shape. Now, however, we know that shape is odd because two galaxies are coming together. Scientists study mergers such as NGC 6052 to better understand galactic evolution, and to get an idea what our own collision will look like a few billion years from now. Galactic mergers are very common in the universe; we know, for example, that Andromeda devoured one of the Milky Way's siblings long ago. The Milky Way-Andromeda collision isn't expected to pose any threat to Earth, because the distances between individual stars in galaxies are so vast, but scientists are still interested in the mechanics of how these interactions happen. "Stars from within both of the original galaxies now follow new trajectories caused by the new gravitational effects," they added. "However, actual collisions between stars themselves are very rare, as stars are very small relative to the distances between them — most of a galaxy is empty space. Eventually, the galaxies will fully merge to form a single, stable galaxy." Hubble launched to Earth orbit in April 1990. The iconic telescope received multiple visits from astronauts over the years, to maintain or replace its components. The last visit, in 2009, installed the Wide Field Camera 3, which obtained the new image. Hubble also took an image of NGC 6052 with an older instrument, Wide Field Camera 2; scientists released that one in 2015. Hubble is expected to keep operating well into the 2020s. Its successor, the $8.9 billion James Webb Space Telescope, is scheduled to launch in 2021.